Immediately following a death, the deceased should not, according to Tradition, be left unattended. A Shomer, or “watchman,” stays with the deceased from the time of death until the funeral and burial. 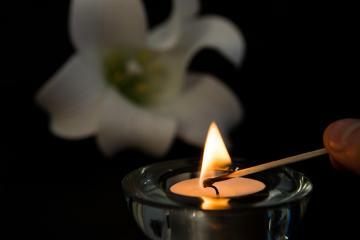 It is appropriate for members of the family or a designated person to stay with the deceased and the custom in many communities is for the family to provide the Shomer. A mourner in Judiasm is one who is defined as being Kaddish related, which means they are obligated to observe the rites of mourning for the deceased. Those who are considered mourners are the spouse, parent, sibling or child of the deceased. It’s important to realize that other family members, although not technically considered mourners, may choose to observe many of the rites of mourning because of the close relationship they had with the deceased. From the time of death until the burial, the mourner is considered an Onen and is relieved of many of the normal obligations incumbent upon an individual. The main obligation of an Onen is to arrange for the proper Jewish burial of the deceased. The first person to be called should be your rabbi or the deceased’s rabbi. A time is not set for the funeral until the rabbi has been contacted. The rabbi will do whatever is necessary to change his or her schedule to accommodate the family’s wishes. Respect is always shown to the deceased as well as toward the mourners. This is one of the reasons why Traditional Jewish funerals are held so soon after death. It is more respectful to inter the body within a reasonable amount of time rather than having an unnecessary delay. Of course, waiting for relatives to come from a far distance is a respectful reason to delay the burial. This is a decision the family should make in consultation with their rabbi. Viewing the deceased is not a Jewish custom, and Tradition teaches us that it is disrespectful to look at a person who can not look back. Therefore, a Traditional funeral would be one in which the casket is kept closed and there is no viewing, except for purposes of identification by the family, if they so desire. Unless local laws require, embalming, a chemical process of sanitation and temporary preservation, should be avoided. Your funeral director will advise you if any laws apply that would make embalming necessary. If the family wishes, your funeral home will contact the Chevra Kadisha. The Chevra Kadisha, the sacred society, is a group of pious men and women who have taken on the obligation of ritually preparing the deceased. They perform the Taharah, which means purification. These people ritually bathe the deceased and then dress the person in Tachrichim, shrouds, the Traditional burial garments. (Male members of the Chevra Kadisha prepare a male deceased and female members of the Chevra Kadisha prepare a female deceased.) Usually made of white, pure linen, the Tachrichim symbolize that we are all equal in death. The simple white garment without pockets is physical proof that we take nothing with us when we leave this world, and that G-d judges us on our merits and deeds, not the material wealth we may have accumulated. Tradition calls for a simple wooden casket, made without metal parts. Again, this is something the family will decide upon privately, and any casket they select will be the appropriate and correct one. Most Traditional funerals do not have flowers as this is considered an unnecessary and frivolous adornment. Many Reform and Conservative Jews choose to have some flowers present for the service, and as long as the rabbi has no objections, it is permissible. Most rabbis do not object to the family’s wish to have a small floral tribute on the casket, but don’t want Jewish funerals to resemble the funeral customs of non-Jews in having the casket surrounded by flowers. Funerals usually last about twenty minutes and consist of the recitation of Psalms, Scripture readings and a eulogy. Prior to or after the services, the mourners perform the ritual of K’riah, the rending of the garment. This ancient custom is symbolic of the tear that’s in the mourner’s heart. Traditionally the clothing is torn, but many people today use a black ribbon that is attached to the outside of the clothing. When people see the ribbon, or the tear in the clothing, it is a sign that that person is a mourner. The ribbon is worn, or the clothing cut, on the left side of the person if they are mourning the death of a parent. For all other Kaddish relatives, the ribbon or clothing is cut on the person’s right side. This is to acknowledge that the relationship with a parent is different, and, therefore we observe the difference by performing the K’riah, on the side closest to the heart. When we see a person wearing the ribbon or torn clothes, we should offer our condolences to the mourner, even if we don’t know the mourner or whom they are mourning. Mourners are already uncomfortable and when we see them, if we avoid talking to them or ignore the fact that they are mourners, it adds to their feelings of loneliness and isolation. A special prayer is said when the clothing or ribbon is cut. …’Dayan Ha’emet,’ …”Blessed is the Judge of Truth.” This is said because as mortals, we can not understand G-d’s decrees and judgments. Rather, all we can do is accept those judgments, and to acknowledge that G-d is in control of all life. The ribbon, or torn clothing is worn Traditionally for seven days, except on Shabbat. When mourning the death of a parent, the ribbon or torn clothing is traditionally worn for thirty days. As with Shiva, some festivals and holidays affect the observance and practice of the K’riah, and it is suggested you speak with your rabbi for the interpretations as they affect an individual set of circumstances.